"The city beats the country ten to one in summer. Fools go out tramping in muddy brooks and wear themselves out trying to catch little fish as long as your finger. Stay in town and keep comfortable--that's my idea." O. Henry's clever wordplay hints that his characters-- especially those who escaped the summer heat for the mountains-- are playing dangerous games of chivalry and deception, as did Demetrius and Lysander, both in love with Hermia. Read on to discover who is the donkey. The roof gardens put on so many extra waiters that you could hope to get your gin fizz now--as soon as all the other people got theirs. The hospitals were putting in extra cots for bystanders. For when little, woolly dogs loll their tongues out and say "woof, woof!" at the fleas that bite 'em, and nervous old black bombazine ladies screech "Mad dog!" and policemen begin to shoot, somebody is going to get hurt. The man from Pompton, N.J., who always wears an overcoat in July, had turned up in a Broadway hotel drinking hot Scotches and enjoying his annual ray from the calcium. Philanthropists were petitioning the Legislature to pass a bill requiring builders to make tenement fire-escapes more commodious, so that families might die all together of the heat instead of one or two at a time. So many men were telling you about the number of baths they took each day that you wondered how they got along after the real lessee of the apartment came back to town and thanked 'em for taking such good care of it. The young man who called loudly for cold beef and beer in the restaurant, protesting that roast pullet and Burgundy was really too heavy for such weather, blushed when he met your eye, for you had heard him all winter calling, in modest tones, for the same ascetic viands. Soup, pocketbooks, shirt waists, actors and baseball excuses grew thinner. Yes, it was summertime. A man stood at Thirty-fourth street waiting for a downtown car. A man of forty, gray-haired, pink-faced, keen, nervous, plainly dressed, with a harassed look around the eyes. He wiped his forehead and laughed loudly when a fat man with an outing look stopped and spoke with him. "No, siree," he shouted with defiance and scorn. "None of your old mosquito-haunted swamps and skyscraper mountains without elevators for me. When I want to get away from hot weather I know how to do it. New York, sir, is the finest summer resort in the country. Keep in the shade and watch your diet, and don't get too far away from an electric fan. Talk about your Adirondacks and your Catskills! There's more solid comfort in the borough of Manhattan than in all the rest of the country together. No, siree! No tramping up perpendicular cliffs and being waked up at 4 in the morning by a million flies, and eating canned goods straight from the city for me. Little old New York will take a few select summer boarders; comforts and conveniences of homes--that's the ad. that I answer every time." "You need a vacation," said the fat man, looking closely at the other. "You haven't been away from town in years. Better come with me for two weeks, anyhow. The trout in the Beaverkill are jumping at anything now that looks like a fly. Harding writes me that he landed a three-pound brown last week." "Nonsense!" cried the other man. "Go ahead, if you like, and boggle around in rubber boots wearing yourself out trying to catch fish. When I want one I go to a cool restaurant and order it. I laugh at you fellows whenever I think of you hustling around in the heat in the country thinking you are having a good time. For me Father Knickerbocker's little improved farm with the big shady lane running through the middle of it." The fat man sighed over his friend and went his way. The man who thought New York was the greatest summer resort in the country boarded a car and went buzzing down to his office. On the way he threw away his newspaper and looked up at a ragged patch of sky above the housetops. "Three pounds!" he muttered, absently. "And Harding isn't a liar. I believe, if I could--but it's impossible--they've got to have another month--another month at least." In his office the upholder of urban midsummer joys dived, headforemost, into the swimming pool of business. Adkins, his clerk, came and added a spray of letters, memoranda and telegrams. "I wonder what kind of bait Harding used." She was all in white that day; and thereby Compton lost a bet to Gaines. Compton had wagered she would wear light blue, for she knew that was his favorite color, and Compton was a millionaire's son, and that almost laid him open to the charge of betting on a sure thing. But white was her choice, and Gaines held up his head with twenty-five's lordly air. The little summer hotel in the mountains had a lively crowd that year. There were two or three young college men and a couple of artists and a young naval officer on one side. On the other there were enough beauties among the young ladies for the correspondent of a society paper to refer to them as a "bevy." But the moon among the stars was Mary Sewell. Each one of the young men greatly desired to arrange matters so that he could pay her millinery bills, and fix the furnace, and have her do away with the "Sewell" part of her name forever. Those who could stay only a week or two went away hinting at pistols and blighted hearts. But Compton stayed like the mountains themselves, for he could afford it. And Gaines stayed because he was a fighter and wasn't afraid of millionaire's sons, and--well, he adored the country. "What do you think, Miss Mary?" he said once. "I knew a duffer in New York who claimed to like it in the summer time. Said you could keep cooler there than you could in the woods. Wasn't he an awful silly? I don't think I could breathe on Broadway after the 1st of June." "Mamma was thinking of going back week after next," said Miss Mary with a lovely frown. "But when you think of it," said Gaines, "there are lots of jolly places in town in the summer. 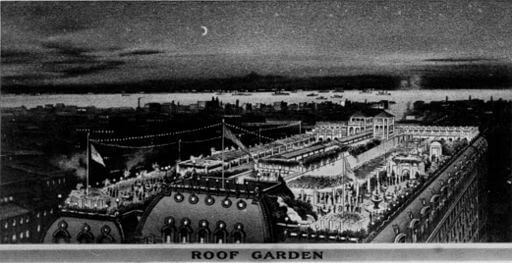 The roof gardens, you know, and the--er--the roof gardens." Deepest blue was the lake that day--the day when they had the mock tournament, and the men rode clumsy farm horses around in a glade in the woods and caught curtain rings on the end of a lance. Such fun! Cool and dry as the finest wine came the breath of the shadowed forest. The valley below was a vision seen through an opal haze. A white mist from hidden falls blurred the green of a hand's breadth of tree tops half-way down the gorge. Youth made merry hand-in-hand with young summer. Nothing on Broadway like that. The villagers gathered to see the city folks pursue their mad drollery. The woods rang with the laughter of pixies and naiads and sprites. Gaines caught most of the rings. His was the privilege to crown the queen of the tournament. He was the conquering knight--as far as the rings went. On his arm he wore a white scarf. Compton wore light blue. She had declared her preference for blue, but she wore white that day. Gaines looked about for the queen to crown her. He heard her merry laugh, as if from the clouds. She had slipped away and climbed Chimney Rock, a little granite bluff, and stood there, a white fairy among the laurels, fifty feet above their heads. Instantly he and Compton accepted the implied challenge. The bluff was easily mounted at the rear, but the front offered small hold to hand or foot. Each man quickly selected his route and began to climb, A crevice, a bush, a slight projection, a vine or tree branch--all of these were aids that counted in the race. It was all foolery--there was no stake; but there was youth in it, cross reader, and light hearts, and something else that Miss Clay writes so charmingly about. Gaines gave a great tug at the root of a laurel and pulled himself to Miss Mary's feet. On his arm he carried the wreath of roses; and while the villagers and summer boarders screamed and applauded below he placed it on the queen's brow. 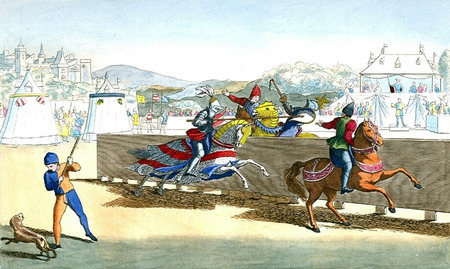 "You are a gallant knight," said Miss Mary. "If I could be your true knight always," began Gaines, but Miss Mary laughed him dumb, for Compton scrambled over the edge of the rock one minute behind time. "I beg your pardon, Mr. Gaines," said Adkins. The man who believed New York to be the finest summer resort in the world opened his eyes and kicked over the mucilage bottle on his desk. "I--I believe I was asleep," he said. "Nonsense!" said the other. "The city beats the country ten to one in summer. Fools go out tramping in muddy brooks and wear themselves out trying to catch little fish as long as your finger. Stay in town and keep comfortable--that's my idea." "Some letters just came," said Adkins. "I thought you might like to glance at them before you go." The man who said he thought New York the finest summer resort in the country dropped into a cafe on his way home and had a glass of beer under an electric fan. "Wonder what kind of a fly old Harding used," he said to himself. O. Henry's story may inspire you to read A Midsummer Night's Dream. Add A Midsummer Knight's Dream to your own personal library.